A cat carrier is an essential item for any cat parent who travels regularly with their feline friend. And don’t forget, cat carriers are also indispensable for visits to the veterinarian or transporting your cat in an emergency situation. A good carrier should keep your cat safe, secure, and comfortable when you’re on the road. That’s why it’s important to choose a model that’s well-made and large enough to accommodate your cat. We reviewed dozens of cat carriers to identify the best of the best, based on quality, design, feedback from Amazon users, and other factors such as affordability. We then narrowed our search down to 5 of the best cat carriers available today. A popular carrier that’s perfect for transporting your cat in style and comfort. We’ve identified the Sherpa Travel Original Deluxe Airline Approved Pet Carrier as the best cat carrier for most pet parents. 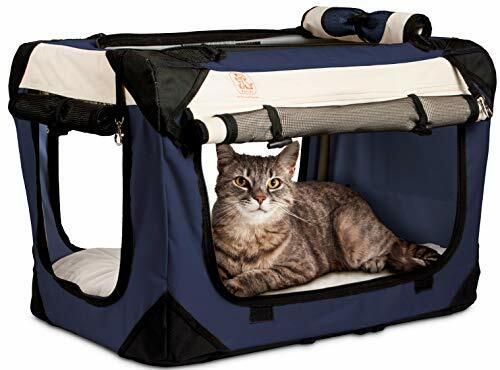 Standout features include a patented spring wire frame that allows the carrier to conform to under-seat requirements on airlines, and excellent ventilation to keep your pet cool. The Sherpa Travel Original Deluxe Airline Approved Pet Carrier is perfect for transporting your cat. It stood out to us during the course of our research thanks to its high-quality construction and well-thought-out design. The carrier is airline approved and features a patented spring frame that allows it to conform to under-seat requirements. It also has mesh windows for ventilation, top and side entry with locking zippers, and an adjustable, no-slip carry strap. Other key features of this well-made carrier include a machine-washable faux lambskin liner, seatbelt and luggage strap, and rear pocket for storage of pet supplies. Reviewers say the carrier is convenient, comfortable, and easy to carry. A simple, well-designed cat carrier with a range of great features. The AmazonBasics Soft-Sided Pet Travel Carrier is designed to keep your pet protected, secure, and comfortable while traveling. The carrier features mesh panels for ventilation, carrying handles and an adjustable shoulder strap, and a machine-washable fleece pet bed. The combination of comfort, functionality, and simplicity makes this carrier a worthy runner up pick. It is great for transporting your cat around town, and conforms to under-seat dimensions of most major domestic airlines. This budget-friendly soft cat carrier features a lightweight, fashionable design. if you’re looking for a colorful, well-priced cat carrier with a lightweight and foldable design, the Pet Magasin Luxury Soft-Sided Cat Carrier is an excellent choice. The convenient carrier features comfortable interior padding, mesh windows for ventilation, a carry handle, and an adjustable shoulder strap. It is also airline approved and conforms to under-seat dimensions. The carrier can be unzipped to fold flat for storage, and holds its shape when in use. It is made from rugged, waterproof, and washable material that will withstand daily wear and tear. A sturdy plastic cat carrier with a smart 2-door design. If you’re in the market for a plastic cat carrier, you won’t go wrong with the AmazonBasics Two-Door Top-Load Pet Kennel. The carrier is made from durable, heavy-duty plastic with a steel-wire front door. It also features a two-door, top-load design that offers convenience and visibility. The top and bottom of the carrier snap together with four latches to keep your pet secure. Screws are also included with this product for added reinforcement. Most reviewers say the AmazonBasics Two-Door Top-Load Pet Kennel is well-made, affordable, and easy to assemble. This roomy soft cat carrier features excellent ventilation to keep your kitty cool and comfortable. The PetLuv Happy Cat Premium Pet Carrier features a roomy design with all-around windows, heavy-duty tear-resistant rubber mesh, and closable flaps. It’s great for car rides thanks to its adjustable seatbelt loops, and comes complete with locking zippers and reinforced seams for added safety. Other key features include four access panels for ventilation and easy loading, adjustable shoulder straps, and a removable and washable plushy bed. This premium soft cat carrier also folds flat for convenient and easy storage. The product has received excellent reviews, and many pet parents say they highly recommend it. A cat carrier is an indispensable item for any pet parent who wants to travel with their feline friend. Whether you’re taking a road trip, heading off on vacation, or just need to transport your cat to the vet, the right carrier can make your life a whole lot easier. Cat carriers also provide temporary shelter for your cat, and are extremely useful in emergency situations. Thankfully, there are lots of cat carriers to choose from that will keep your kitty comfortable, safe, and secure when you’re on the move. If you’re looking for a convenient solution for transporting your cat to their carrier, be sure to check out our review of the best cat harnesses. Size. It’s important to choose a carrier that’s large enough to accommodate your cat. Before purchasing a cat carrier, carefully measure your pet and check the dimensions of the carrier you are considering. It should be large enough to give your cat room to lie down, stand up, and turn around comfortably. Hard vs. soft carrier. Consider whether a hard or soft carrier will best suit your needs. Hard carriers are generally more robust than soft carriers, but they can be heavy to transport. By comparison, soft carriers are usually lightweight, but may not be strong enough to withstand excessive chewing and scratching. You will need a hard carrier if your pet is traveling in the cargo hold of a plane. If your cat is traveling in the cabin, soft carriers are usually a better option as they can fit more easily under plane seats. Airline approved. Make sure your carrier is airline approved if you will be traveling by plane. Please be aware that although many cat carriers are advertised as “airline approved”, requirements can vary between airlines. For this reason, it’s best to check the guidelines of your preferred airlines before buying a cat carrier. Ventilation. A good cat carrier should be well ventilated to prevent your cat from overheating. Look for a soft cat carrier with mesh sides or a hard carrier with ventilation slots. Portability and foldability. A well-designed cat carrier should be portable enough to transport easily. Features to look out for include carry handles and adjustable shoulder straps. Some carriers also fold flat for easy storage, this is a useful feature if you are short on space in your home. 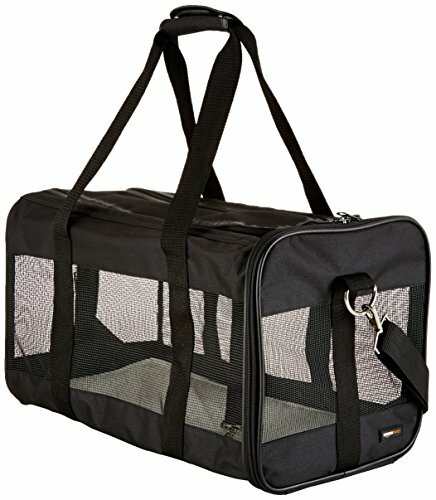 Is a hard or soft cat carrier better? Hard cat carriers are generally more durable than soft cat carriers, this makes them a good choice for cats that are prone to scratch and chew excessively. They are also recommended for transporting your cat in the cargo hold of an airplane. While less robust than hard carriers, soft cat carriers are more lightweight and portable. This makes them suitable for short trips, or when traveling with your cat in the cabin of an airplane. Can I put two cats in one carrier? It is generally not recommended to put two cats in one carrier. Cats can become stressed when traveling, and may display aggression. How long can my cat stay in a carrier? It is okay to keep your cat in a carrier if you are taking a short trip. However, if the trip is more than a few hours long, it’s important to take your pet out of the carrier for short breaks to eat, drink, and use their litter box. Should you cover a cat carrier? Yes. Most cats prefer their carrier to be covered. Covering your cat’s carrier with a blanket can help reduce anxiety and prevent stress while traveling. We looked at 20 other dog cat carriers. Even though they didn’t make our 5 best cat carriers, they’re the best of the rest and each is still is great option for your kitty. The information you’ll need to compare each one is included with the listing. A durable plastic cat carrier with excellent ventilation and a simple, lightweight design. Reviewers say this carrier is good quality and easy to assemble. A sturdy plastic cat carrier with an ergonomic handle and secure side locks. This carrier also features ventilation grills for adequate air circulation. This spacious cat carrier has a soft midsection and hard top that allows it to be folded flat for easy storage. This well-made and reliable carrier from Petmate is perfect for transporting your cat. Standout features include 360 degree ventilation and an oversized doorway for easy entry. A roomy plastic cat carrier with a patented side-opening door that opens easily and cats feel comfortable walking into. A collapsible soft cat carrier with a range of convenient features including a double-door design, self-locking zippers, and an adjustable luggage strap that doubles as a pocket. This easy-to-use cat carrier has a range of useful features including mesh ventilation panels, soft interior lining, and a zippered side pocket for storing travel accessories. This attractive soft cat carrier from Bergan combines style, functionality, and comfort. Reviewers say the product is well made and easy to transport. This functional and convenient cat carrier is made from lightweight, waterproof material. It also features an expandable design that gives your cat more space on the move. 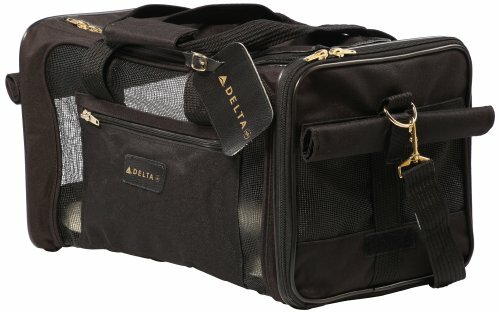 A durable and collapsible airline approved soft cat carrier with mesh windows and a machine-washable faux lambskin liner. This collapsible cat carrier from Necoichi is perfect for traveling or emergency situations. Reviewers say the carrier is spacious and convenient. A fully collapsible, convenient and comfortable cat carrier. This product is made from sturdy fabric that’s lightweight and easy to clean. This fashionable and functional cat carrier from Pawfect Pets features an ultra-safe, extra-durable design with claw-defense mesh on the top and sides. A comfortable and compact soft cat carrier with a hard top and bottom for extra security and protection. A sturdy, lightweight cat carrier with expandable sides and enhanced stability. Reviewers of this carrier say it’s comfortable and spacious. This soft cat carrier from PETYELLA has a range of great features including a luxurious pet bed, collapsible design, and expandable sides. 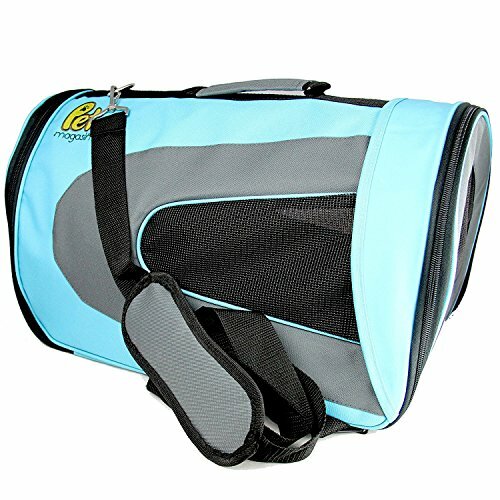 A comfortable soft cat carrier with a modern design that’s waterproof, well ventilated, and easy to clean. This collapsible, lightweight cat carrier from SportPet Designs assembles easily and stows away in seconds. Reviewers say the carrier is cute and compact. 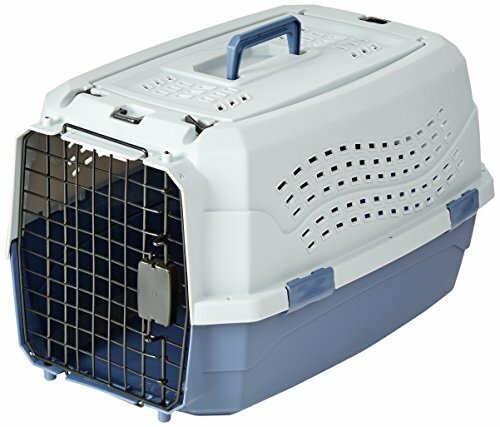 This sturdy, airline approved cat carrier features a simple design with a foldable wire frame and two entrances for easy access. A large, soft-sided cat carrier that meets the under-seat requirements of most airlines. This carrier also features a removable base insert, mesh windows, and adjustable shoulder straps.